Sanderson Ford is at it again and this time, they are teaming up with Roush Performance for a double dose of American muscle in the form of the “Jack Roush Tribute” Mustang. To be sold at the Barret-Jackson Auction, this Mustang has a very special purpose. 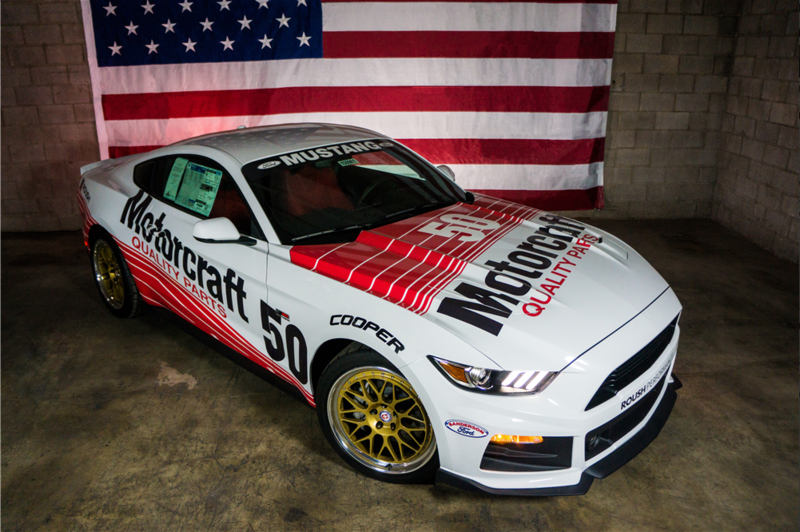 With the final auction price totaling to $175,000, not only will the proud owner have the 50th Anniversary Mustang AND the 30th Anniversary of Jack Roush’s Champion Motorcraft Mustang all in one, but 100% of the proceeds will be going to benefit the Military Assistance Mission (MAM). MAM is an organization that “serves local Arizona military, their families, and wounded heroes with financial and morale aide”, as stated by the MAM CEO, Margy Bons. Margy Bons started MAM in honor of her son, Michael Adam Marzano, who fought and died for our country in Iraq. The 2015 Ford Mustang was donated by Sanderson Ford and made into what it is by the Roush Performance team. With a Phase 2 Roush-charged 5.0-liter V8 power plant that boasts an incredible 727hp, courtesy of Roush Performance’s R2300 TVS supercharger, this Mustang has more horsepower per liter than any other American muscle care on the market. And the fun doesn’t stop there! The white exterior keeps it classy while the red interior gives it a dangerous feel. Want to not only be the envy of all of your friends, but also help a great cause? You’ve come to the right place! Peoria, Arizona is home to a wonderful community that thrives outside of Phoenix. The city boasts a population of more than 154,000 and has a number of interesting things to do and see. The history behind the now-thriving area has a major significance in the area. Paying a visit to Peoria isn’t something many regret, especially after they’ve stopped by one of the local hotspots! The city’s roots lie with four families who relocated to the area from Peoria, Illinois. The new arrivals were quick to file a plot map, complete with streets. Their efforts brought the Santa, Prescott, and Phoenix Railroad which gave the city’s popularity a boost as a popular stop. There are dozens of museums oriented around space but the Challenger Space Center offers a unique look at what lies above us. The learning environment is perfect for families and adults alike. Activities include simulated space flight missions where visitors can take on the role of mission control, flight crews, and more. There are few better places to grab a steak than Firebirds Wood Fired Grille. This premier restaurant is a local favorite due to its friendly atmosphere, helpful staff, and delicious food that brings return visitors time and time again. We here at Sanderson Ford hope to see you around Peoria sometime soon! This past summer on July 24th, 2016, a tragic accident occurred in which seven-year-old Dylan was thrown off a motor boat during his summer vacation and sustained injuries to his jaw, right arm, and right leg. Sanderson Ford has come together with the community to raise money for Dylan’s recovery through the Race for Recovery event. If you want to help, all you have to do is donate – and instantly be enrolled in a raffle to win a 2016 Stage 3 Roush Mustang. You can enter the Race for Recovery during normal business hours at Sanderson Ford or attend any local car show events listed on the Dylan’s Recovery website before November 13th. 100% of the proceeds will go towards Dylan’s hospital expenses. If you donate $10, you will receive 1 raffle ticket, but you can also donate $50 for 6 tickets or $100 for 13 tickets. The drawing will happen on Monday, November 14th. 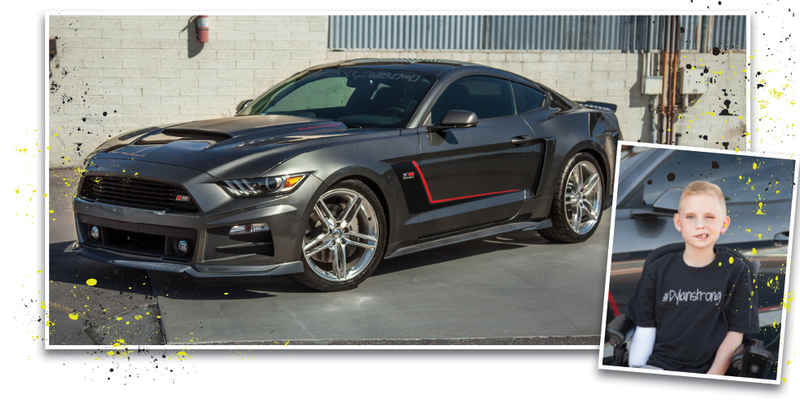 The 2016 Stage 3 Roush Mustang has an MSRP of $69,215, so enter for your chance to win this beautiful sports car. Of course, no matter who wins, you will still be donating to a worthy cause – the wellbeing and future of Dylan and his family. None of the proceeds from the Race to Recovery will be used to cover the cost of promotional events or the vehicle itself, so you can rest assured your money is in good hands. It’s not every day you turn 61, but here at Sanderson Ford, that’s exactly what we just did! Sanderson Ford’s 61st anniversary was a milestone for our staff and technicians. Through our long years in the Phoenix community, we’ve made leaps and bounds and have the awards to show for it. Customer satisfaction has been our top priority since our founding and with this latest anniversary, we’re looking to offer specials that prove it. The Phoenix community is important to us, and we have a reputation to uphold for excellent service. We’ve won both corporate and community awards for decades, including the coveted “President’s Award.” Not only have we won the prestigious award consistently, we’ve often been the only dealership in the Phoenix Metro area to receive it. Originally founded on May 1, 1955, by Don Sanderson Ford in Glendale as Glendale Motors, we’ve grown to offer and service every model in the Ford lineup. We also offer a selection of used cars for first-time or cost-conscious drivers. A premiere Ford dealership, we offer every service possible. From Ford parts to routine maintenance to repairs, and more, we here at Sanderson Ford are all about going above and beyond customer expectations. Let us here at Sanderson Ford demonstrate our commitment and show you why we’ve won many prestigious awards year after year. Marking our 60th Anniversary, we’re launching some major sales from May 1st – May 16th. In fact, this is the biggest sale we’ve ever had, offering customers an array of incentives just for stopping by. Come celebrate 60 years of quality deals during the next couple of weeks. 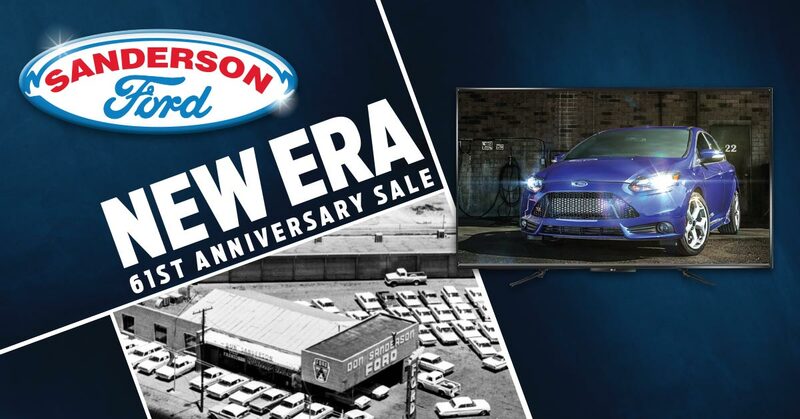 The Sanderson Ford 60th Anniversary Sale is offering customers some incredible deals, some of which you can get just for stopping by. For every new vehicle purchased, customers will also have their choice between a free 50-inch smart TV or a $500 Visa gift card. Who doesn’t like free stuff? Not sure if you want to buy a new car? Customers who simply stop by during our Anniversary Celebration will receive a pair of Diamondback tickets (while supplies last). On top of all these great deals, Sanderson is offering an array of great discounts and has its largest selection of inventory since the dealership began. Here at Sanderson Ford, we’ve gotten used to a certain high standard in our work—and hopefully that has been reflected in our customer service over the years. Actually, we don’t have to rely on hope. Sanderson Ford has again been recognized with the President’s Award. It’s the tenth straight time we’ve been named to the list, and the 17th time overall. The award highlights dealerships that deliver amazing results, both in terms of sales and customer satisfaction. As such, there’s no greater honor for a dealership then to win the President’s Award. That’s what makes our tenth annual award so special—it proves that we’ve lived up to our own high standard for a very long time. Sanderson Ford is one of eight Phoenix Region dealerships to win the award this year, which both puts us in an elite group and also highlights how great the Phoenix Region is. However, no other dealer has a streak longer than four years, which puts Sanderson in a class all of its own. Come see us then to learn more about our methods and to check out our inventory today! Do you or someone you know have limited mobility? If the answer is yes, then Sanderson Ford has the solution for you. 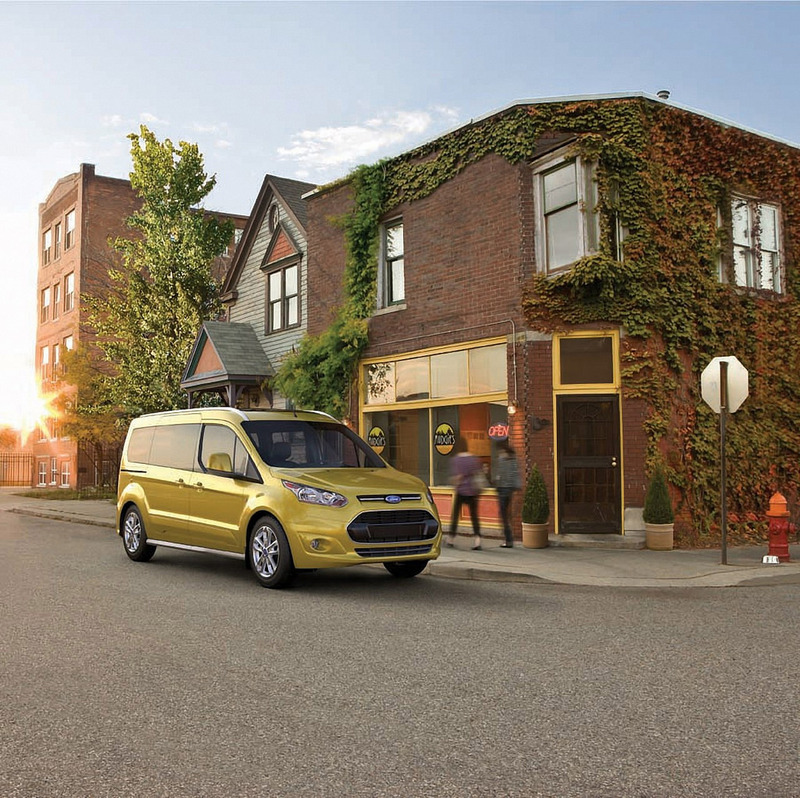 The 2014 Transit Connect is the most popular vehicle for customers with limited mobility who are participating in the Ford Mobility Motoring Reimbursement Program. The Transit Connect features a very unique style, many capabilities for those with limited mobility that are looking to live more independently, as well as affordability. The suggested retail price of the 2014 Transit Connect Wagon is $24,525 and it can be upfitted for an additional cost. This includes a premium seat added that lowers for easier access to the vehicle, or a lift that can be used to accommodate a motorized scooter or wheelchair. The extra uplift costs depend on the technology. Interested in purchasing a 2014 Transit Connect to make your life easier? Do you have questions about whether or not this is the right choice for you? Then contact Fred Scelzo, an employee of Sanderson Ford who is dedicated to stocking handicap vehicles and making sure you get the vehicle you need! We all know that Phoenix can get pretty toasty around this time of year. We are fortunate enough to be able to escape the heat with cool air and water, but there are some that aren’t as fortunate. At Sanderson Ford, we have once again teamed up with the Salvation Army to help in the Salvation Army Hydration Project. If you are looking for a way to help, read on! You can do your part in bringing in cases of water to the dealership from now until June 21st. If you are not able to donate a case of water, a $5 donation is also accepted and we will purchase the water for you! 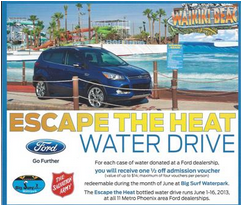 As an incentive, each case or monetary donation will get you a half-off coupon to Big Surf Water Park! Our goal was to collect 200 cases of water and as of now, we are over 500 cases! All donations stay local, so help us end the Salvation Army’s Hydration Project strong by donating a case of water today!